Please welcome Jeff Soloway to the Miss Demeanors. Jeff was formerly an editor and writer for Frommer’s travel guides, Jeff Soloway is now an executive editor in New York City. In 2014 he won the Robert L. Fish Memorial Award from the Mystery Writers of America. His Travel Writer mystery series is published by Alibi, Random House’s digital imprint for crime fiction. 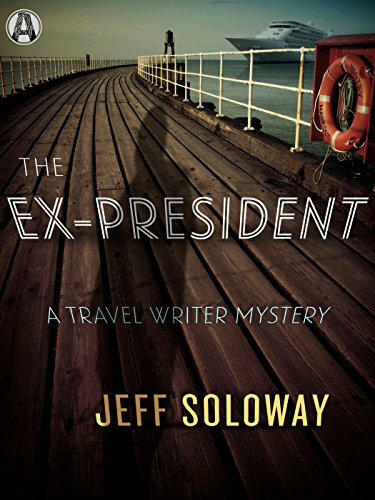 The third novel in the series, The Ex-President, about the resignation and mysterious comeback of America’s new billionaire president, is just out. I’m very happy to join the Miss Demeanors as a guest blogger! Like Susan Breen, I publish a mystery series for Alibi, Penguin Random House’s digital imprint for crime fiction. My latest installment, The Ex-President, is my first foray into political fiction. I think it’s the best thing I’ve ever done. But writing it almost drove me insane. My plan, hatched way back in late 2015, was to write a Trump novel. At the time, Donald Trump was one of 18 Republican candidates for president, an outrageous goofball with hilarious delusions of national importance. My story would feature a similarly outrageous character named Carlton Chomp, who was sponsoring a Caribbean cruise in order to raise money for his run for the presidency. It seemed to me the perfect premise for a comic satire. Trump was hilarious; my version of him would take his absurdity to even greater heights; the jokes would write themselves. As writers, we’re all familiar with the moment when a character runs away with the story—when the character’s unexpected thought or speech or action leaps up within you, and you feel you have no choice but to follow as some strange force propels your story in a thrilling new direction. Well, in this case, it wasn’t the character that was careening out of the control but the real world itself. And it took my novel with it. In early 2016, most of the other Republican presidential contenders began to drop out. Trump was now a serious candidate, not a joke (or not just a joke), and I had to recast the premise of my novel accordingly. And then Trump won the nomination. He was a major force in American politics. His name would be recorded in history books. The jokes I had written were now much less funny. And then he won the Presidency. Like so many Americans, I was stunned. I had misunderstood my country completely. And, of course, I had to rewrite my novel from scratch. So I did. I decided that this time, I would have to keep so far ahead of history that there was no chance it would overtake me. Obviously my Trump character would have to be elected President—but I decided he would quit halfway through his term. And then he would start a mysterious comeback. He would begin again to hold rallies, appear on the television, raise money. Everyone would wonder why. Obviously he wanted something new, something that suited his ambitious even better than the Presidency. But what? It would be up to my hero to find out. The novel that resulted, while still a comedy, was weirder, sadder, and more serious than the one I originally planned. I hope it’s also richer, but I don’t really know. We usually think of inspiration as springing from some mysterious well deep within us. For me it came from the world outside. I wonder if that makes the story somehow less mine. But that’s a question that hardly matters to the reader.